Provide comfort for the family of Kevin Campbell with a meaningful gesture of sympathy. Kevin S. Campbell, 63 of Sanford, Florida, formerly of Ashland passed away, Saturday, January 19, 2019. He was born October 24, 1955 in Ashland to William F. and Melva (nee Reece) Campbell. Kevin was a 1973 graduate from Ashland High School. He was employed at Braddock Metallurgical Company where he worked as a tool & die maker for more than 10 years. Kevin was previously employed at Timken Co. in Ashland for 20 years. Throughout his life, Kevin was an avid reader enjoying Stephen King Novels, a Cleveland Brown fan, fishing, and playing pool. He was an artistic gentleman who loved music. 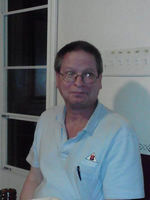 Kevin is survived by one daughter, Karey Campbell of Columbus; one son, Kyle (Karina) Campbell of Sanford, Florida; his mother, Melva Campbell of Ashland; one twin brother, Keith (Diane) Campbell of Ashland; three sisters, Jill (fiancée Frank Weiler) VanDyne of Crestline, Cathy Campbell of Norwalk, and Sue Martin of Ashland; and some cousins, nieces, and nephews. He is preceded in death by his father, William F. Campbell who passed away on August 22, 2014; one brother, William Lee Campbell; his previous wife, Karen McBride; maternal grandparents, H.G. and Almina Reece; and his paternal grandparents, William and Lois Campbell. Funeral services will be held, Saturday, February 9, 2019 at 2:00 p.m. in the Denbow-Gasche Funeral Home with Major Larry Shade officiating. Friends may call one hour prior to the service from 1:00 p.m. to 2:00 p.m. in the funeral home. To send flowers in memory of Kevin Scott Campbell, please visit our Heartfelt Sympathies Store. Rich & Marilyn Campbell and Family sent flowers to the family of Kevin Scott Campbell. Rich & Marilyn Campbell and Family purchased flowers for the family of Kevin Campbell.